Here's the next installment of our gun test preview. This week, OL editor Todd Smith profiles the latest shotgun from Winchester, the Super X3. This autloader created a lot of buzz in the gun industry, and the testers enjoyed it on the sporting clays course. For the complete results of the 2006 Gun Test look for the June/July issue of Outdoor Life. Also, a new video from the shooting range will be posted next week. To watch this one, click on the image. 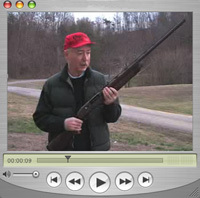 Click here to watch other gun test videos. I can't believe that you would show a video of a terrorit with a black assault shotgun made of plastic and metal. That really scared me. Why do people need guns like that? I'm Jim Zumbo and I hate scary guns. And I hate people with scary guns. In fact I hate the freedom we have that people can own scary guns. SHAME ON OUTDOOR LIFE , I THINK THAT WAS A BAD THING YOU DID TO AN OLD FRIEND, JIM ZUMBO WAS AN OLD AN TRUSTED BUDDY TO MILLION OF READERS I FELL LIKE I KNEW HIM . I CANNOT BELIEVE WHAT OUTDOOR LIFE HAS DONE TO JIM ZUMBO BY TAKING HIM OFF AS HUNTING EDITOR.OBVIOUSLY HE WAS NOT FAMILIAR WITH SEMI-AUTO ASSAULT RIFLES AND MAYBE HE WAS SCARED BY SEEING THESE RIFLES IN THE WRONG HANDS,I'M CONCERNED TOO BECAUSE OF THE FIREPOWER THESE RIFLES HAVE.JIM HAS APOLOGIZED SEVERAL TIMES TO EVERYONE AND THAT SHOULD NOT HAVE BEEN NECCESARY.IF OUTDOOR LIFE FEELS THEY CANNOT REINSTATE JIM ZUMBO THEN THE THOUSANDS IF NOT MILLIONS OF HIS FANS CANNOT SUPPORT OUTDOOR LIFE MAGAZINE.EVERYONE IS HUMAN ,NOBODY IS PERFECT AND I'M NOT CONDEMMING ANY OTHER RIGHT CITIZEN'S HAVE. "THE RIGHT TO FREE SPEECH." I had missed several issues and was dismayed to find that Jim Zumbo is no longer the Hunting Editor for your magazine. Although I disagree with him on his "scary guns" comments, I had always looked forward to his insight into the hunting sports. It seems to me his comments came from a position of politics or ignorance, not an informed study of the facts. And though I do disagree with his comments, I also felt it was unfair of your magazine to remove him from his position. This, too, was politically motivated and while I may disagree with Zumbo, he is entitled to his opinions. After all, isn't that why you publish your magazine? The PC opinion is that all hunting and shooting sports are evil. We, as hunters, are accustomed to having unpopular opinions, yet we look to your fine publication for affirmation that we are in the right. What you have done amounts to censorship and I am very disappointed. Sad to say, but you have lost a loyal reader.